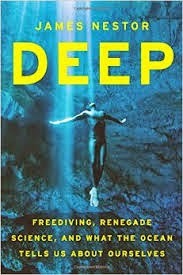 Deep by James Nestor was a really interesting book that starts off about freediving and then covers so much more about the ocean and life in it. Nestor for a 2012 issue of Outside Magazine wrote "Open Your Mouth and You're Dead" on competitive freedivers going down hundreds of feet below the ocean surface on a single breath and Deep reminded me of the great Susan Casey book The Wave (which I wrote about in 2010), but Casey's book probably more about what happens on the surface of the water and Nestor's underneath it. One of the details covered by Nestor included the distinction between competitive freediving as an odd and somewhat sadomasochistic sport and freediving not for depth records, but as a way to reach and interact with the ocean and life at depth. In this regard, there's great material in the book about freediving for the purpose of studying shark behavior as well as sperm whale communication. Additionally, Nestor writes about depths that freedivers can't reach, with him journeying over 2,000 feet underwater in a submarine off the coast of Honduras and writing about research done in the hadal zone some 28,000 feet deep. This part was particularly fascinating with writing of how much life down there as a result of hydrothermal vents and a process known as chemosynthetic life. Really a fascinating and wide-ranging book from Nestor.